I say Boot Key - Marathon because I’m not sure what is what. I think Marathon is the town and Boot Key the name of the island, but I’ve been wrong before. We made it to Marathon. It was a very nice sail – finally, but not without some drama. Leaving Key West we had to motor south some before we could turn east and sail. Well, it was a bit bumpy and it wasn’t long before the cat lost his breakfast and Roberta almost added a sympathy bark to the mix. By the time the sails were up and things smoothed out both my crew were out cold in the cockpit. They both rallied as we entered Boot Key harbor. 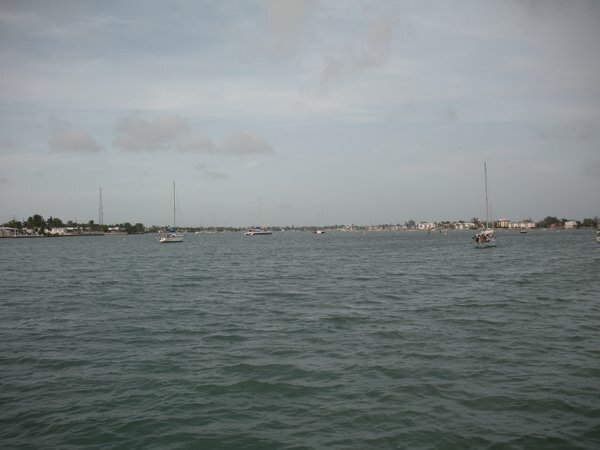 Tomorrow it’s on to the Key largo area where we’ll anchor again for the night. It looks like the winds will cooperate again so we can sail. Here is a picture of the harbor. Not many boats here although there are a lot of moorings – the lack of boats is probably due to the season.